Now’s your time to shine! Euphoria Institute of Beauty Arts & Sciences can train you for the career you love â with the skills, in-depth knowledge, and confidence you need to become a true success in the exciting beauty industry! At Euphoria, you’ll learn the latest techniques used in professional salons â and have access to professional products used by the pros. You’ll enjoy the support of experienced, professional instructors, plus â you’ll have the unique opportunity to work hands-on with real clients in our student salon clinics. 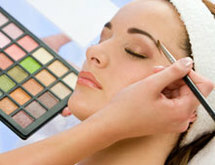 Euphoria Institute of Beauty Arts & Sciences offers convenient day and evening classes at each of our campuses. Financial Aid is available for those who qualify. And once you graduate, our Career Placement Assistance professionals are ready to help you start a beautiful career! All of our Euphoria locations are accredited by the Accrediting Council for Independent Colleges & Schools (ACICS), and offer the industry recognized Pivot Point Designer’s Approach curriculum. So while acquiring training and earning respected credentials, you’ll also have access to a network of beauty professionals, offering you valuable career connections. Financial aid is available for those who qualify. Programs vary by campus.